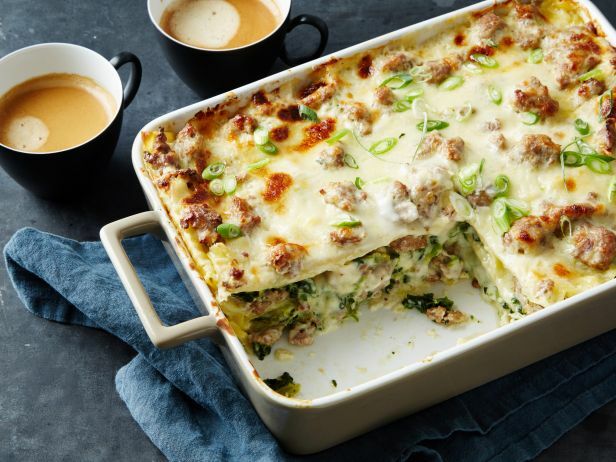 Not just for breakfast - we love this creamy lasagna for dinner. Then - weekend breakfast leftovers! Dovetailing tip: You have already cooked sweet Italian sausage during Meal 1. Use the Italian sausage in place of the breakfast sausage in this recipe. Bring a large pot of salted water to a boil. Add the noodles, and cook according to the package directions. Strain into a colander, and toss with some oil. Drape the noodles over and around the side of the colander to cool. Meanwhile, heat 3 tablespoons oil in a large nonstick skillet over medium-high heat. Add the sausage and scallion whites, and cook, stirring and breaking the meat up into bite-size pieces (not crumbs), until the sausage is browned and cooked through, about 8 minutes. Sprinkle the flour over the cooked sausage, and stir until it is completely absorbed. Add 2 cups milk, and stir until it starts to thicken. Stir in the remaining 2 cups milk, bring to a simmer and stir until the sauce is thick enough to coat the back of a spoon, about 2 minutes. Stir in 2 teaspoons salt, 1 1/2 teaspoons pepper and the nutmeg. Remove the sauce from the heat, and let cool. Mix together the mozzarella, Cheddar and Parmesan in a medium bowl. Oil a 9- by 13-inch baking dish. Spread about 4 tablespoons of the sauce (without big pieces of sausage) over the bottom. Arrange 4 slightly overlapping noodles to fully cover the bottom of the dish. Spread 1/3 of the remaining sauce over the noodles. Spread 1/2 the spinach in an even layer. Sprinkle with about 1/3 of the scallion greens, 1/4 teaspoon salt, a few grinds of pepper and 1/3 of the cheese mixture. Continue layering with 4 more noodles, 1/2 of the remaining sauce, the remaining spinach, 1/2 of the remaining scallion greens, 1/4 teaspoon salt, a few grinds of pepper and 1/2 of the remaining cheese. Finish the lasagna with the remaining noodles, sauce and cheese. Cover the top with plastic wrap, and refrigerate overnight. Do the same with the remaining scallion greens. Preheat the oven to 350 degrees F. Remove the plastic wrap from the baking dish, and cover with foil. Bake until the cheese is melted and bubbly, about 45 minutes. Uncover the dish, and continue to bake until the lasagna is slightly browned, 10 to 15 minutes. Top with the remaining scallions, the parsley and a sprinkle of black pepper. Let sit for at least 15 minutes, then slice and serve. 2017 Diet Improvement? It’s in NUTS! How to Have Extra Time for More Cook’n!